Prof. Jang-Ung Park's research team is posing for a portrait. From left are Dr. Kuk Joo Kim, Prof. Park (School of Materials Science and Engineering), and Byeong-Wan An. 3D printing technology has recently attracted significant media attention. However, there seems to be a multitude of problems with current 3D printers, as they have failed to deliver on its promise to revolutionize manufacturing due to the higher costs, long print times, as well as low resolution. On June 15, a team of researchers at UNIST has announced that they may have developed a high-resolution 3D printing technology that is capable of producing flexible, bendable, or curved electronic circuits on a flexible substrate, , ranging from low conductivity plastics to high conductivity metal materials. Schematic illustration of bridge-like Ag structures on a flexible substrate. According to the team, led by Prof. Jang-Ung Park (School of Materials Science and Engineering) at UNIST, this method is capable of producing affordable high-resolution 3D patterns at room temperature. 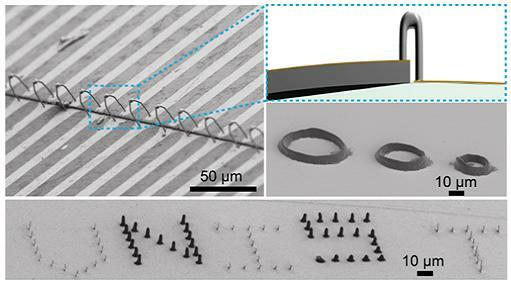 Moreover, these printed 3D patterns are as small as 0.001 millimeter in size, which is even thinner than a red blood cell. The research team expects that this 3D e-jet method will offer a promising strategy as an additive process to be combined with conventional fabrication techniques for highly integrated devices, and indicates substantial promise for use in next-generation electronics. “This new technology could bring us a step closer to realizing wearable 3D printing electronic devices with enhanced stretchability and electrical and mechanical reliability,” says Prof. Park. This work has been supported by the Ministry of Science, ICT and Future Planning and the Ministry of Trade, Industry and Energy of Korea through Basic Science Research Program of National Research Foundation and funded by the Korea Institute of Machinery and Materials and Development Program of Manufacturing Technology for Flexible Electronics with High Performance.